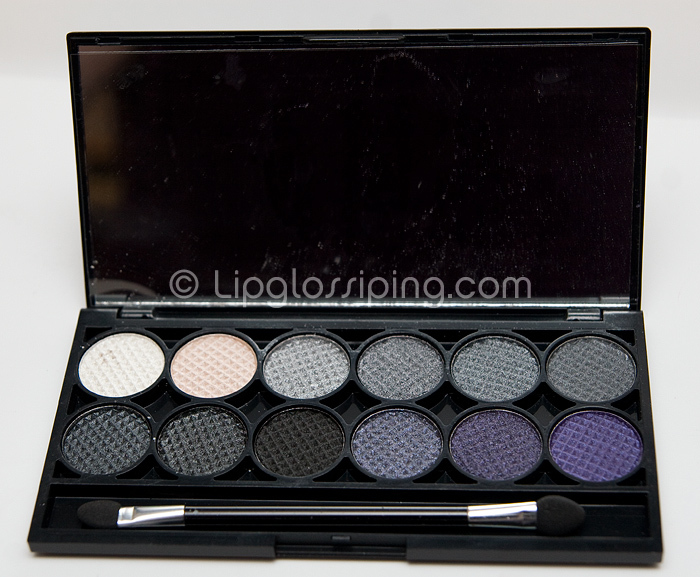 This is Sleek’s latest addition to their highly popular palette family. It’s basically an all-in-one smokey eye kit. Two highlight shades and variations of blacks/greys with a purple (or 2) thrown in. Texture wise, they’re the same creamy, slightly crumbly but highly pigmented shadows that we’ve come to know and love from Sleek. I wish, wish, wish that the shades between the highlights and the first grey were more graduated. There seems to be an awfully big jump from those first two shades into what (for me) is crease colour territory. 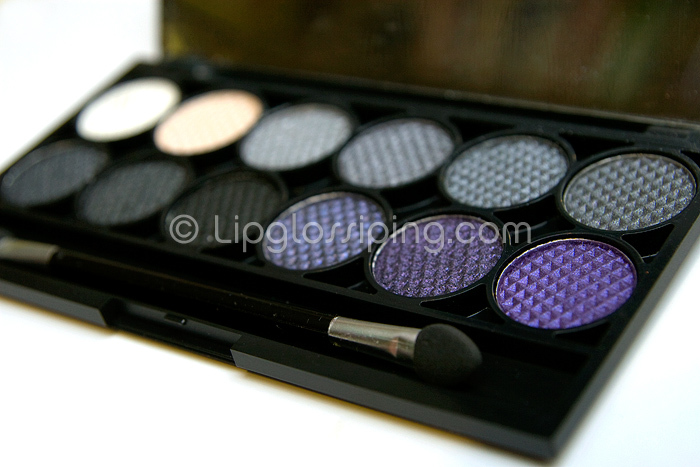 As I don’t generally wear dark shades on my lids, this palette ultimately consists of 10 crease colours. 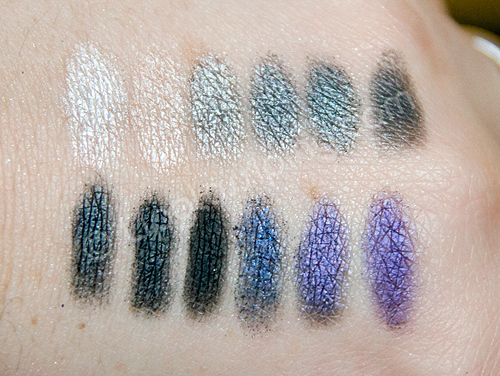 If you count, left-right… top-bottom… 4 & 5 are too simillar as are 7 & 8 and even 11 & 12 which is such a shame, because this is a wonderful palette idea from a company that produce great shadows for a great price but honestly, I think it’s a “could have done better”. I’ll get lots use out of it, and for less than £5 it’s definitely not something I’d ever regret buying, I’m just sad thinking about how good it could have been. It’s Limited Edition, and from experience these palettes sell out quicker than a Bon Jovi concert, so get down Superdrug quick! I thought the exact same thing – some of the shades are just TOO similar to be justifiable! My favourite Sleek palette is still Jewels, always will be – great variety of shades in that one. Although I’m definitely going to pick up the Sunset palette when I can find it (was sold out when Graphite was picked up for me – funny, you’d think the LE one would go out of stock quicker!). Orange shades for blue eyes = hawt! The colours are gorgeous, but definitely designed to stand out against darker skin tones and stunning against a deep complexion. Having a paler complexion, though, I sometimes find these shades overwhelming…. Some of the shades are v similar, but, as you said, for less than £5 can’t really grumble. This palette is still not mine. If I haven’t bought it by tomorrow I shall be very cross with myself. Most of the shades are very similar. Not sure if it would look much different on my skin (olive toned). I did pop into superdrug about 3 times in the past week and they’ve been sold out! No fair! Went to Superdrug this morning with the express intention of purchasing the Graphite palette. There it was, in all its glory, waiting to be bought (they had loads!). When I opened it, my overwhelming thought was “oh, is that it? It’s so *samey*!” I was so disappointed! Back on the shelf it went. So I had a look at the Storm palette, and was SO much more impressed with that one! The colours are far more wearable and more likely to be worn on a daily basis. I have loads of ‘smokey eye palettes’ at home, the best being a Go Cosmetics trio which Servinya did a tutorial on not so long ago. I also bought the Sleek Ink Pot in Espresso, but when I got it home and opened it, it has completely dried out, so I’ll either replace it or ask for a refund. Not sure which yet. I guess that teaches me to check these things before you buy them, but they’ve always got these security seals on them which always makes me feel as though I’m going to be pounced on by Security if I break them. @Leanne – I didn’t get Jewels, I’m really loving the Sunset one though – just beautiful! @Kelly – Glad you like them! @Jamilla – Yes… I can’t wear black shadows at all, but greys are fab for my pale skin. @Em – They have a really nice finish to them aswell! @Rhamnousia – Are you cross with yourself? @PCMP – argh, hope you find one soon! Yes, Storm is beautiful. One could easily survive on that palette alone for a very long time. Yes, the ink pots seem to suddenly dry up overnight? Very odd…. My black one had been fine for months… then I went to use it one day and it had shrunk back from the sides and gone hard as hell. Lid was on tight too.. tres strange! I always take my palettes up to the counter and stand at the end (so the SA can see me) and I just ask if it’s ok to take a peek as I’ve bought ones that have been broken in the past. I’ve never had any problems doing that.